İsmet Özçelik, a Turkish academic with a UNHCR refugee card, was detained again on Thursday in Malaysia amid news that two other Turkish citizens who were believed to have been kidnapped were in fact detained by the authorities. “Today my father was detained again in Malaysia. There are two other Turkish citizens also kidnapped by the Malaysians. He has Refugee Card from UNHCR. My father is still under protection of UNHCR in Malaysia. I’m waiting for all human rights institution to help. 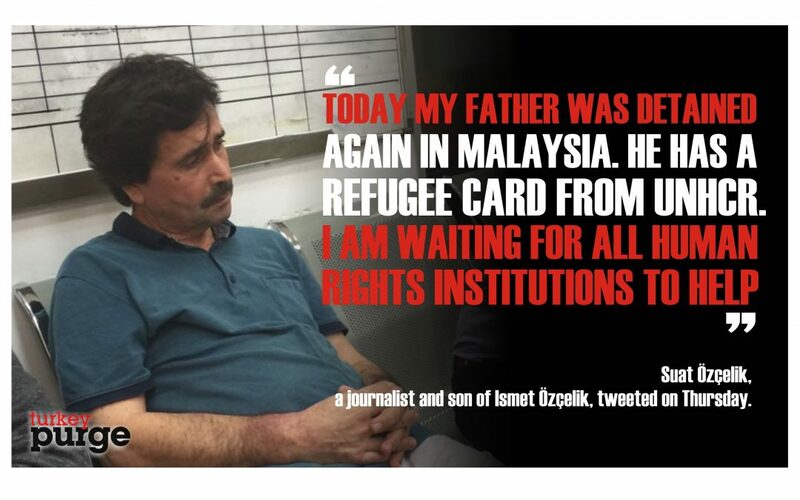 There is no statement from Malaysian authorities about my father,” Suat Özçelik, a journalist and son of İsmet Özçelik, tweeted on Thursday, calling on international rights organizations Amnesty International and Human Rights Watch monitor the developments. İsmet Özçelik was initially detained and put in prison on Dec. 13, 2016 upon an alleged request by Turkish authorities in Malaysia. Malay security personnel reportedly raided the house of academic İsmet Özçelik (59) on the grounds that his passport had been cancelled by Turkey over alleged involvement in a coup attempt on July 15. “They [Malay authorities] were in plain clothes. They said they were given authority to deport him [Özçelik] to Turkey,” Özçelik’s son told Turkey Purge in an e-mail. Lawyers representing Özçelik are now seeking renewal of the visa in order to secure his release from prison for an offense for which he has yet to stand trial or be convicted of. Muhammad Faizal Faiz Hasani, one of his lawyers, recently spoke to Malay Mail Online regarding the issue. Faizal said the Magistrates Court here had denied Özçelik bail because the Immigration Department had cancelled his visa just a day after his arrest on Dec. 13, 2016. “Ismet needs to get officials re-validate his visa and determine why Immigration cancelled it. If it was at the request of the Turkish Embassy, why and on what grounds. “The magistrate may let us have his passport for a few days for renewal with Immigration if we so request; the magistrate will only release Ismet on bail after his visa is renewed,” he said when describing the court’s views on the matter. “In the meantime, Ismet will deteriorate in prison without medication,” he added. Özcelik’s daughter has filmed a video of herself, calling on Malay officials to free his father. Turkey survived a military coup attempt on July 15 that killed over 240 people and wounded more than a thousand others. After the putsch, the government along with President Recep Tayyip Erdoğan accused the Gülen movement for the attempt. The movement rejects any involvement. The Turkish government, however, launched a widespread purge aimed at cleansing sympathizers of the movement from within state institutions, dehumanizing its popular figures and putting them in custody.